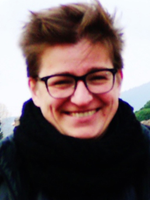 Katrin Wilhelm works as post-doc researcher in Heritage Science and is member of the Oxford Rock Breakdown Laboratory. She completed her DPhil from the School for Geography in March 2016. She obtained her diploma in restoration, art technology and heritage science from the Technical University Munich (TUM) in 2011.Before her academic career she worked as a trained stone mason and as a site manager for heritage site conservation. Her research focusses on built heritage preservation and perception. This includes preventive conservation with focus on environmental impacts, weathering processes and non-destructive testing in-situ: "Lab in your pocket", applied cultural heritage science: From Ancient Knowledge to 21th Century Applications. "Learning From The Past To Preserve The Future" and most recently the effect of historic environment on people's well-being and conceptualising "Urban Culture Dose". Katrin works in a collaboration between the OxRBL (Oxford Rock Breakdown Laboratory) at the University of Oxford and the Getty Institute. The aim of the project is to develop a robust, multi-method approach for evaluating conservation treatments for sandstone. Katrina is involved in the project management, coordination and research of this highly interdisciplinary project which contributes to sustainable heritage. The cooperation between the Max-Planck Institute for Art History and Florence and the Fraunhofer Institute for Building Physics, Munich (Holzkirchen) combines expertise in technical-science, art history and reception. The project addressed holistically both Pompeii’s tangible and intangible conservation history, perception and preservation, as inseparable part of Pompeii’s legacy. Contributions inform heritage material science (best long-term outdoor performance) and sustainable understanding as place of transnational, European history and culture. Katrin is lead on an interdisciplinary project which contributes to Oxford's local history and Heritage Science. The 13 carved busts that ring the perimeter of the Sheldonian Theatre and the History of Science Museum are the third generation, installed in the 1970s. The former sets (dating from 1669 and 1868) were replaced because they were badly eroded and disfigured by rainfall and air pollution, despite conservation efforts. the contribution of built heritage to biodiversity and eco-systems. From May to July 2019 the Weston Library will host an exhibition to mark the 350th anniversary since the unveiling of the original heads on Broad Street. The project is organising a multimedia exhibition and engagement strategy to share their findings with the public, and produce documentation to inform future management and heritage conservation practice. Search #FindTheHeads on twitter to follow tweets about the project. Katrin is co-lead on a collaborative project with the History of Science Museum and with financial support of the University's Diversity Fund. This project works in conjunction with the History and Mysteries of Oxford's Stone Heads project, which addresses the past and present of the stone Heads, whereas the TOH explores what the future might hold for these Heads. The project called for artists of all media to submit their vision of more diversified public sculpture and installation representing marginalised groups such as POC/BAME, LGTB+, disabled and women. The successful artists will have their work installed alongside research from the School of Geography and the Environment (OxRBL), as part of a special 'Oxford Heads' exhibition at the Weston Library, opening in May 2019. Part of the evaluation of the project will look at the beneficial effects on people's well-being through material dialog of biophilic (humanoid and organic) urban built heritage and additional modern sculpture and installation with potential future implications on urban planning policy, public health intervention and integrated heritage science. Katrin has been involved as adviser in the collaborative project between the British Council, World Monument Fund and the Petra National Trust. The project trained female and male Jordanian locals and Syrian refugees in traditional stone masonry skills to equip with the ability to work on conflict-affected built heritage. Dr Wilhelm contributes to the Heritage Science option and Geographical Techniques (Methods in Physical Geography) course. Further, she supervised work experience students, a Nuffield funded student, BA and MA theses and PhD theses. She took part in admission interviews and organised the UNIQ summerschool field day. With a team she established the SEED (Speedy Expertise Exchange & Discussion) talks in 2015. Desarnaud, J., Viles, H., Kiriyama, K., Simsir, B.B. and Wilhelm, K. (forthcoming) Surface hardness measurements on sandstone: what factors influence the values obtained with the Equotip hardness tester and what does the data tell us?. Morando, M., Wilhelm, K., Matteucci, E., Martire, L., Piervittori, R., Viles, H.A. and Favero-Longo, S.E. (2017) The influence of structural organization of epilithic and endolithic lichens on limestone weathering. Earth Surface Processes and Landforms, 42. Wilhelm, K., Viles, H. and Burke, O. (2016) Low impact surface hardness testing (equotip) on porous surfaces – advances in methodology with implications for rock weathering and stone deterioration research. Earth Surface Processes and Landforms, 41(8): 1027-1038. Wilhelm, K., Viles, H. and Burke, O. (2016) The influence of salt on handheld electrical moisture meters: Can they be used to detect salt problems in porous stone? International Journal of Architectural Heritage, 10(6): 735-748. Wilhelm, K., Viles, H., Burke, O. and Mayaud, J. (2016) Surface hardness as a proxy for weathering behaviour of limestone heritage: a case study on dated headstones on the Isle of Portland, UK. Environmental Earth Sciences, 75(931): 1-16. Wilhelm, K., Viles, H., Winter, E., Burke, O., Engelstaetter, S. and Coyte, K.Z. (2016) Catastrophic limestone decay at the central sanctuary of Iupiter Dolichenus at Dülük Baba Tepesi in South Turkey: causes and implications for future conservation. Conservation and Management of Archaeological Sites. Thiemann, L. and Wilhelm, K. (2014) Zu den Zuschlägen in den oberen Putzlagen antiker römischer Wandmalerei. In, Emmerling, E. (ed.) In Firmitas et splendor: Vitruv und die Techniken des Wanddekors. Siegl, Munich. pp. 181-192. Thiemann, L., Knechtel, M., Elsasser, C., Krautenbacher, B., Wilhelm, K. and Kilian, R. (2014) Zur Glättung antiker römischer Putze und Rekonstruktion. Workshop zur Experimentellen Archäologie. In, Emmerling, E. (ed.) Firmitas et splendor: Vitruv und die Techniken des Wanddekors. Siegl, Munich. pp. 201-224. Wilhelm, K. (2014) Glanz und Glätte der römischen Wandmalerei - Beispiel der Casa di Obellio Firmo. In, Emmerling, E. (ed.) Firmitas et splendor: Vitruv und die Techniken des Wanddekors. . pp. 193-200. Kaiser, C., Wilhelm, K. and Emmerich, R. (2016) Pompeian stucco plaster without aggregates: a case study of reconstruction. The 4th Historic Mortar Conference (HMC) in Santorini, Greece 2016.